Quality vendors featuring Antiques, Rare Books, Vintage Lighting, Estate and Antique Jewelry, 1880’s – 1960’s French & European Prints, Antique Quilts, Depression Glass, Folk art, Vintage Dolls and Toys, Furniture, Vintage Signs, Country Primitives, Clocks, Postcards, Art, Lamps, Collectibles, Americana, Vintage Linens, Garden Items and more….The Suwassett Garden Club will feature a Plant Boutique of hanging baskets, patio planters, herbs and perennials as well as homemade baked goods. 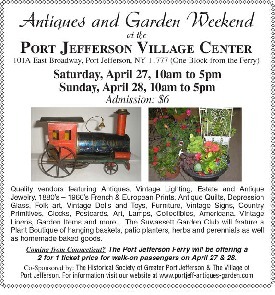 2 for 1 ticket price for walk-on passengers on April 29 & 30. Email or call for your FREE 140-Page Color Catalog! 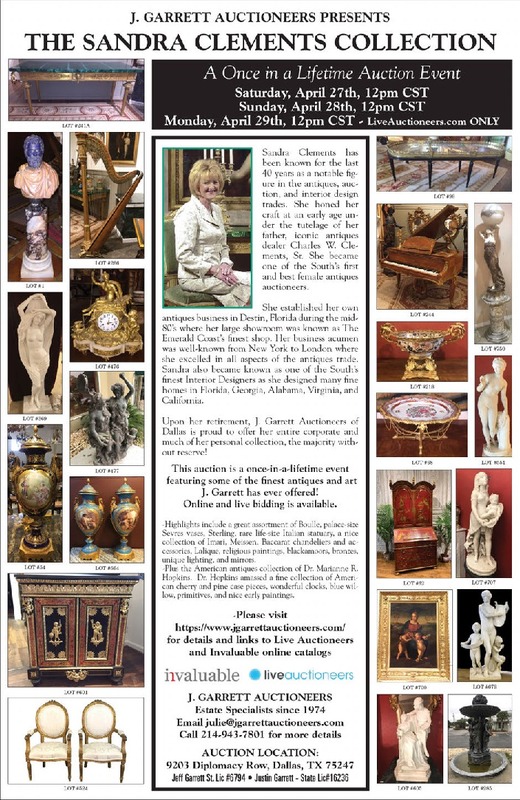 Sandra Clements has been known for the last 40 years as a notable figure in the antiques, auction, and interior design trades. 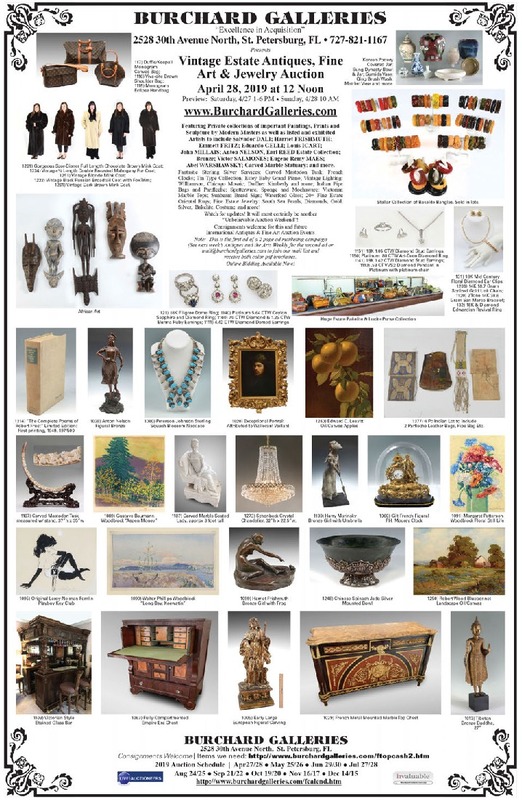 She honed her craft at an early age under the tutelage of her father, iconic antiques dealer Charles W. Clements, Sr. She became one of the South’s first and best female antiques auctioneers. She established her own antiques business in Destin, Florida during the mid- 80’s where her large showroom was known as The Emerald Coast’s finest shop. Her business acumen was well-known from New York to London where she excelled in all aspects of the antiques trade. Sandra also became known as one of the South’s finest Interior Designers as she designed many fine homes in Florida, Georgia, Alabama, Virginia, and California. Upon her retirement, J. Garrett Auctioneers of Dallas is proud to offer her entire corporate and much of her personal collection, the majority without reserve! J. Garrett has ever offered! Online and live bidding is available. 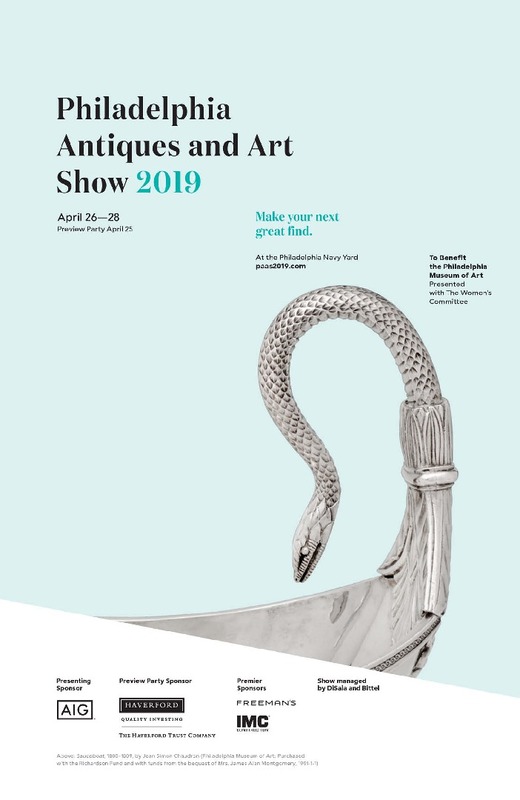 -Highlights include a great assortment of Boulle, palace-size Sevres vases, Sterling, rare life-size Italian statuary, a nice collection of Imari, Meissen, Baccarat chandeliers and accessories, Lalique, religious paintings, blackamoors, bronzes, unique lighting, and mirrors. 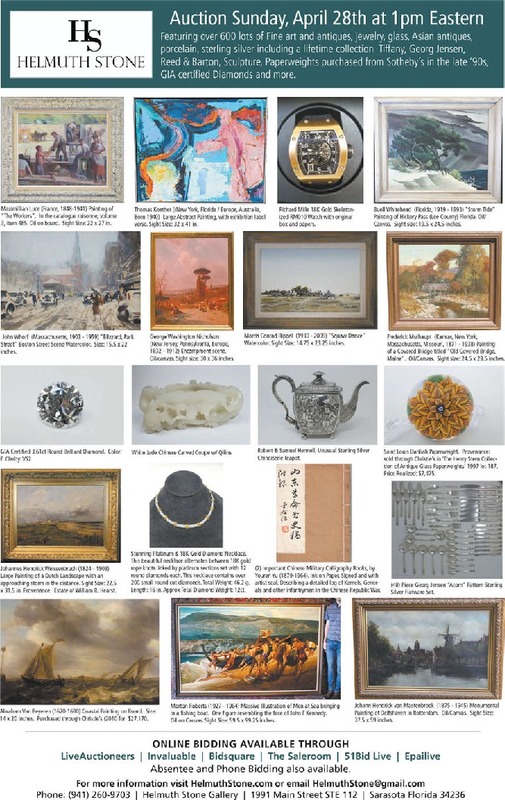 -Plus the American antiques collection of Dr. Marianne R. Hopkins. Dr. Hopkins amassed a fine collection of American cherry and pine case pieces, wonderful clocks, blue willow, primitives, and nice early paintings. 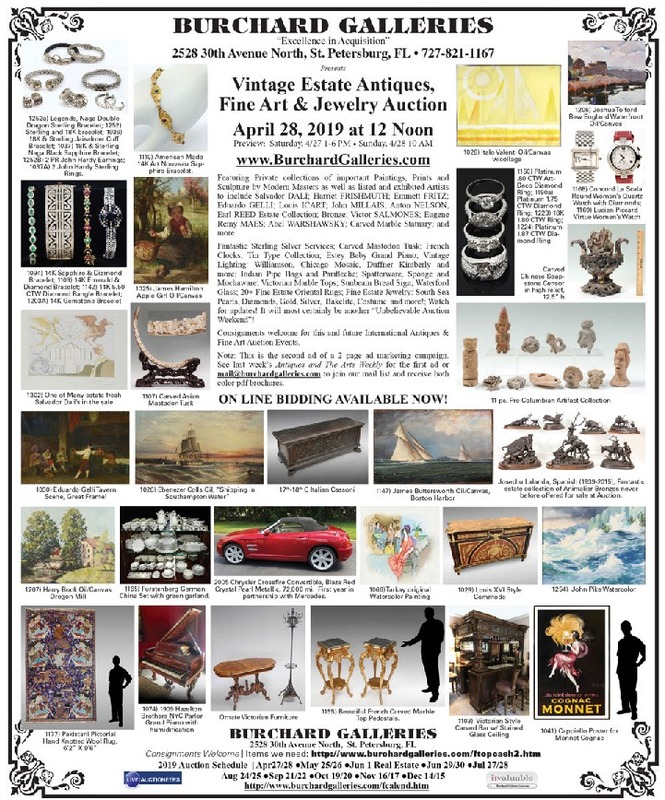 The April Sale at Kaminski kicks off with over 300 lots of fine Chinese porcelains, bronzes and an important 3rd or 4th century Gandhara Buddha on Saturday morning followed by a selection of antiques and furnishings from Palm Beach, Fort Lauderdale and other estates. 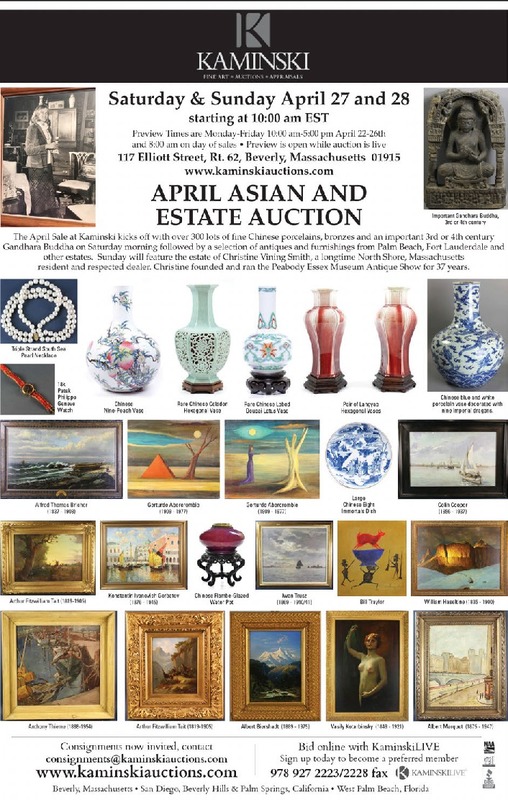 Sunday will feature the estate of Christine Vining Smith, a longtime North Shore, Massachusetts resident and respected dealer. Christine founded and ran the Peabody Essex Museum Antique Show for 37 years. Chinese blue and white porcelain vase decorated with nine Imperial dragons. David Monies (1812-1894) : The Huntsman Oil on Canvas 21 x 19 in. Duane Merrill & Co. is pleased to be offering fine Oriental carpets & accessories from the estate of a local patron of the arts, the contents of a Stowe, VT art gallery owner’s estate, paintings & prints by listed artists; fine glass & china, fine jewelry from a New York City collection, early medical & surgical instruments, gold & silver coins, antique & modern firearms, Early American History, Medical, & Native American reference books from a local researcher & reenactor. 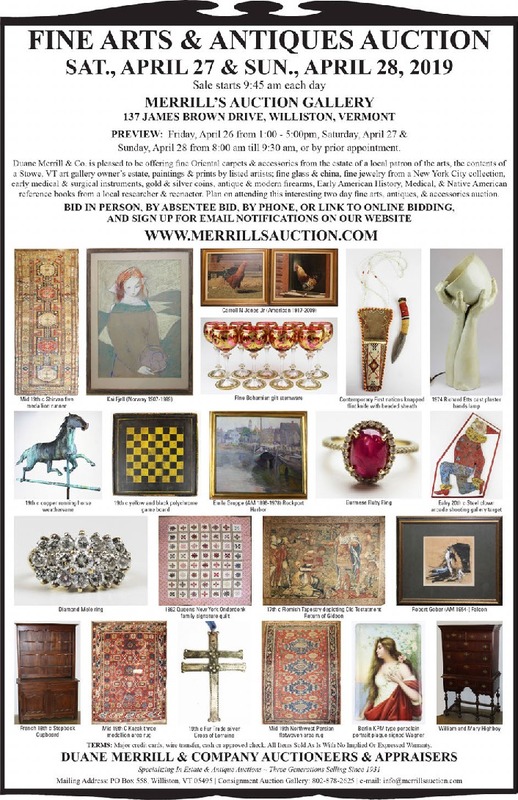 Plan on attending this interesting two day fine arts, antiques, & accessories auction. TERMS: Major credit cards, wire transfer, cash or approved check. All Items Sold As Is With No Implied Or Expressed Warranty. Dealer Space 20′ length x 20′ depth. DOCUMENTS: Martin Luther King I Have A Dream advance text, Anthony Morris letters; Civil War incl soldier letters, rosters, certificates, speeches, diaries incl Battle of Bull Run. BOOKS: Signed incl The House at Pooh Corner, Bertram’s Travels first edition, photography, German, atlases, trade, husbandry, almanacs, medical, religious, occult. 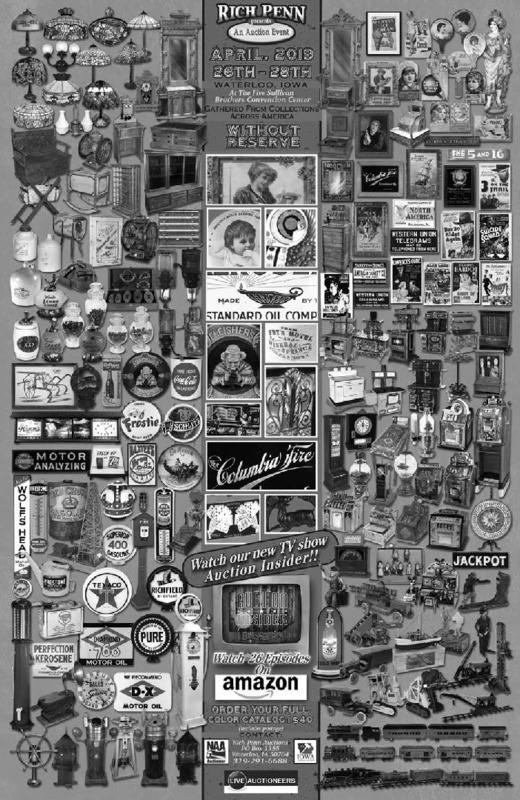 ADVERTISING: Tobacco, cigar, general store, countertop displays, salesman boxes, signs. POST CARDS: Halloween, real photo. PHOTOS: Lindbergh, Military, sports, travel. STAMPS: Vatican City albums, International Postage Stamp Album. invitation to execution, trade cards, medical kits, apothecary cabinet, broadsides. Applicable Buyer’s Premium. Terms: Cash, PA checks. All major credit cards accepted. Food concession. 17th Street exits, Harrisburg PA! 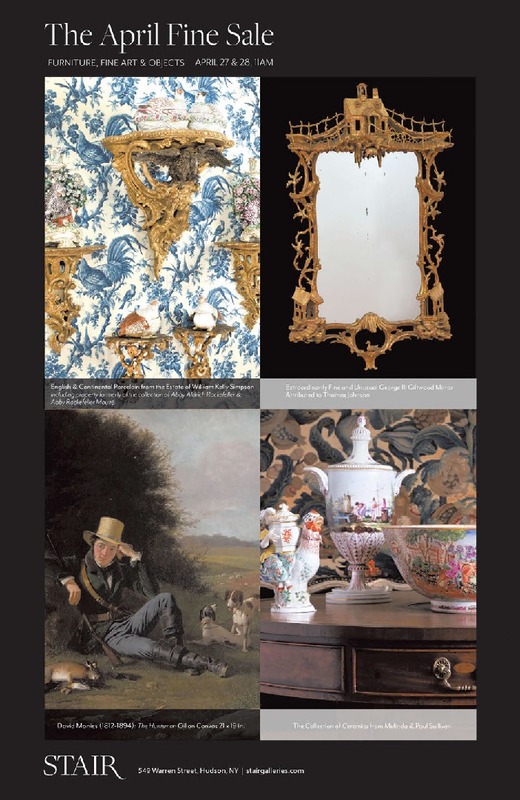 Featuring Private collections of important Paintings, Prints and Sculpture by Modern Masters as well as listed and exhibited Artists to include Salvador DALI; Harriet FRISHMUTH; Emmett FRITZ; Eduardo GELLI; Louis ICART; John MILLAIS; Anton NELSON, Earl REED Estate Collection; Bronze; Victor SALMONES; Eugene Remy MAES; Abel WARSHAWSKY; Carved Marble Statuary; and more. Fantastic Sterling Silver Services; Carved Mastodon Tusk; French Clocks; Tin Type Collection; Estey Baby Grand Piano; Vintage Lighting: Williamson, Chicago Mosaic, Duffner Kimberly and more; Indian Pipe Bags and Parifleche; Spatterware, Sponge and Mochaware: Victorian Marble Tops; Sunbeam Bread Sign; Waterford Glass; 20+ Fine Estate Oriental Rugs; Fine Estate Jewelry: South Sea Pearls, Diamonds, Gold, Silver, Bakelite, Costume and more! receive both color pdf brochures. 1261) Vintage Dark Brown Mink Coat. Korean Pottery Covered Jar; Sung Dynasty Bowl & Jar; Sumida Vase; Qing Brush Wash; Mottled Vase and more. Stellar Collection of Bakelite Bangles. Sold in lots. 1377) 4 Pc Indian Lot to include 2 Parfleche Leather Bags, Pipe Bag Etc. 1273) Schonbeck Crystal Chandelier, 32”h x 22.5”w. 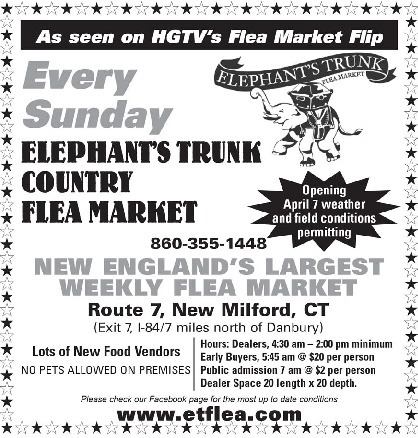 Note: This is the second ad of a 2 page ad marketing campaign. 1165) Furstenberg German China Set with green garland. 1155) Beautiful French Carved Marble Top Pedestals. 1110) American Made 14K Art Nouveau Sapphire Bracelet. 1030) Eduardo Gelli Tavern Scene, Great Frame! 2005 Chrysler Crossfi re Convertible, Blaze Red Crystal Pearl Metallic, 72,000 mi. First year in partnership with Mercedes. Josechu Lalanda, Spanish (1939-2015), Fantastic estate collection of Animalier Bronzes never before offered for sale at Auction. 1252a) Legends, Naga Double Dragon Sterling Bracelet; 1252) Sterling and 18K bracelet; 1036) 18K & Sterling Jaisalmer Cuff Bracelet; 1037) 18K & Sterling Naga Black Sapphire Bracelet; 1252B) 2 PR John Hardy Earrings; 1037A) 2 John Hardy Sterling Rings. and comic book stores. Comic books include: Golden, Silver and Bronze Age. Marvel Premiere #15 CGC 8.5, Tales of Suspense #52 CGC 7.5, Frazetta No 1, Fantastic Four #28 12c, Adventures of The Fly #13 10c, Amazing Spider-Man #1 CGC 9.8, Mystery Tales #51 10c, Astonishing #22 CGC 4.0, Daredevil, Archies, Walt Disney. 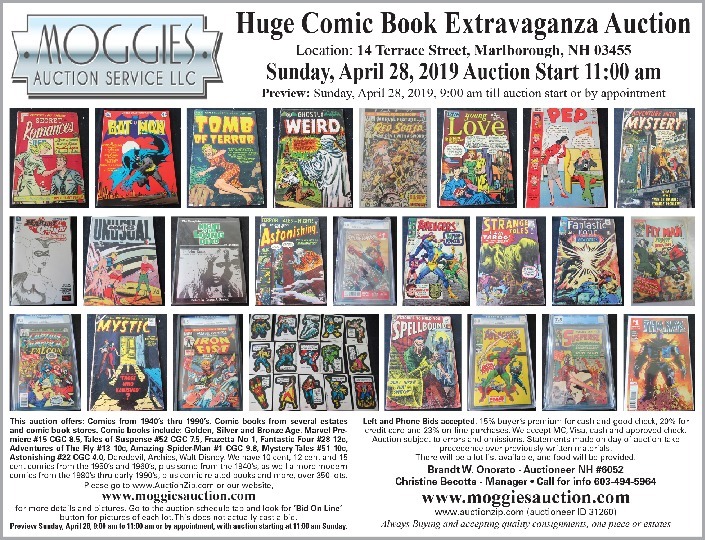 We have 10 cent, 12 cent and 15 cent comics from the 1950’s and 1960’s, plus some from the 1940’s, as well a more modern comics from the 1980’s thru early 1990’s, plus comic related books and more, over 350 lots. button for pictures of each lot. This does not actually cast a bid. credit card and 23% on-line purchases. We accept MC, Visa, cash and approved check. precedence over previously written materials. There will be a lot list available, and food will be provided. 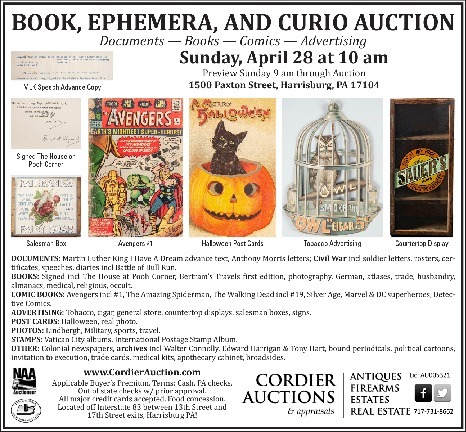 & Sunday from 9 a.m. until Auction Starts. Our Terms: We have an 18% Buyer’s Premium on All Purchases In House, when paid with credit card, and 15%, when paid with cash or check. All Online Purchases have a 20% Buyer’s Premium. 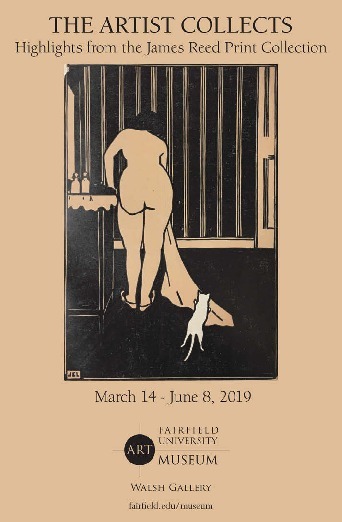 Our Spring auction features modern art, by Earl Hubbard, wonderful fresh items from two prominent Sharon and Litchfield homes. To include: early Staffordshire, collection of portrait miniatures, early Asian porcelains, modern designer furniture, large lots of early blue and white porcelains, garden elements and teak furniture, silver, bronzes,150 pieces of Copeland Spode, traditional antiques, banjo, Oriental carpets, traditional furniture and antiques and much, much more! A great sale! Plan to Attend. This Auction, as Always, is Fast Paced, Unreserved and No Nonsense. GIA certified Diamonds and more. Absentee and Phone Bidding also available. John Whorf (Massachusetts, 1903 – 1959) “Blizzard, Park Street” Boston Street Scene Watercolor. Size: 15.5 x 22 inches. Robert & Samuel Hennell, Unusual Sterling Silver Chinoiserie Teapot. Johann Hendrick van Mastenbroek (1875 – 1945) Monumental Painting of Delfshaven in Rotterdam. Oil/Canvas. Sight Size: 37.5 x 59 inches. (48) Piece Georg Jensen “Acorn” Pattern Sterling Silver Flatware Set. Maximillian Luce (France, 1848-1941) Painting of “The Workers”. In the catalogue raisonne, volume 3, item 485. Oil on board. Sight Size: 22 x 27 in. Frederick Mulhaupt (Kansas, New York, Massachusetts, Missouri, 1871 – 1938) Painting of a Covered Bridge titled “Old Covered Bridge, Maine”. Oil/Canvas. Sight size: 24.5 x 29.5 inches. Richard Mille 18K Gold Skeletonized RM010 Watch with original box and papers. Johannes Hendrick Weissenbruch (1824 – 1903) Large Painting of a Dutch Landscape with an approaching storm in the distance. Sight Size: 22.5 x 31.5 in. Provenance: Estate of William R. Hearst. Stunning Platinum & 18K Gold Diamond Necklace. This beautiful necklace alternates between 18K gold rope knots linked by platinum sections set with 12 round diamonds each. This necklace contains over 200 small round cut diamonds. Total Weight: 46.2 g. Length: 16 in. Approx Total Diamond Weight: 12ct. Thomas Koether ((New York, Florida / Europe, Australia, Born 1940) Large Abstract Painting, with exhibition label verso. Sight Size: 32 x 41 in. George Washington Nicholson (New Jersey, Pennsylvania, Europe, 1832 – 1912) Encampment scene. Oil/canvas. Sight size: 30 x 36 inches. Abraham Van Beyeren (1620-1690) Coastal Painting on Board. Size: 14 x 20 inches. Purchased through Christie’s (2010 for $27,170. (2) Important Chinese Military Calligraphy Books, by Youren Yu (1879-1964). Ink on Paper. Signed and with artist seal. Describing a detailed log of Kernels, Generals and other infantrymen in the Chinese Republic War. Buell Whitehead (Florida, 1919 – 1993) “Storm Tide” Painting of Hickory Pass (Lee County) Florida. Oil/ Canvas. Sight size: 19.5 x 24.5 inches. Morris Conrad Rippel (1930 – 2009) “Squaw Dance” Watercolor. Sight Size: 14.75 x 23.25 inches. Saint Louis Dahliah Paperweight. Provenance: sold through Christie’s in ‘The Henry Stern Collection of Antique Glass Paperweights’ 1997 lot 187. Price Realized: $7,475. Morton Roberts (1927 – 1964) Massive Illustration of Men at Sea bringing in a fishing boat. One figure resembling the face of John F Kennedy. Oil on Canvas. Sight Size: 59.5 x 99.25 inches.